RESEARCH: The type was named by Gordon R. Willey (1949)[i]. Willey and Woodbury (1942) included this type with Marksville Stamped pottery that is very similar in appearance. Willey noted that this type was most commonly found in northwestern Florida. Steve B. Wimberly also recovered examples of Alligator Bayou Stamped pottery from sites along the Tombigbee River in Clarke and Mobile counties, Alabama. TEMPER: Ground Clay or ground sherd tempering gives a soft, chalky texture to the surface. Some specimens were tempered with fine to medium sand. Paste texture varies from course, lumpy, and very contorted to fine-grained and slightly contorted. Paste color varies from chalky white, buff and read-buff to gray-black. SURFACE DECORATION: Decoration consisted of broad incisions made in the semi-soft clay of the vessel before firing and areas of notched or rocker or roulette stamping. Designs consisted of opposed plane and rocker-stamped areas. Incised figures are more often undefined curvilinear and rectilinear figures. In some cases the actual design or figure represented is left plain while the background is filled with stamping. Some designs were also filled in with stamping and the background was left plain. This stamping, if done with a rocker, may be the result of rocking the edge of a thin instrument back and forth on the vessel surface. The zigzag lines may be smooth or dentate. This same effect could have been produced by a small or notched-edge disc. The general impression is one of boldly but surely executed designs. There is little detail. All figures are expressed by wide, flowing bands. Designs cover most of the exterior vessel body except the base. VESSEL FORMS: Known forms are flattened-globular bowls, squared flattened-globular bowls, collard globular bowls, cylindrical beakers, squared beakers, and multiple-orifice vessels. In-curved rims with exterior folds or with marginal thickening on direct, unmodified, out-slanting rims are known. Lips are flat, rounded-flat, or round-pointed in form. Bases may be round, flat and circular, or flat and squared. Appendages of bird head effigies were affixed to the rims. 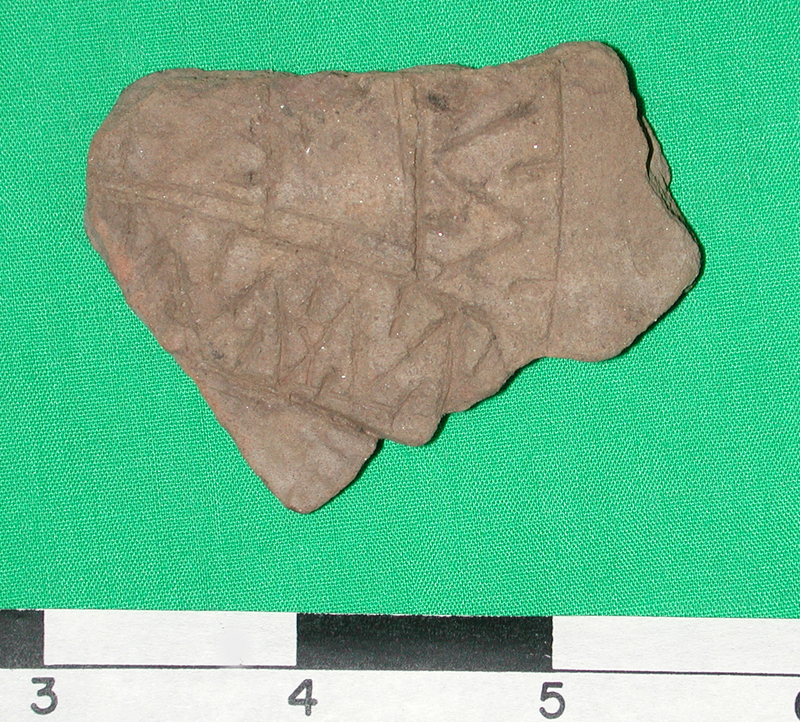 CHRONOLOGY: Alligator Bayou Stamped pottery is a marker of the Middle Woodland Santa Rosa-Swift Creek period. Vessels are occasionally found in mounds which demonstrate the dominance of Weeden Island period types. 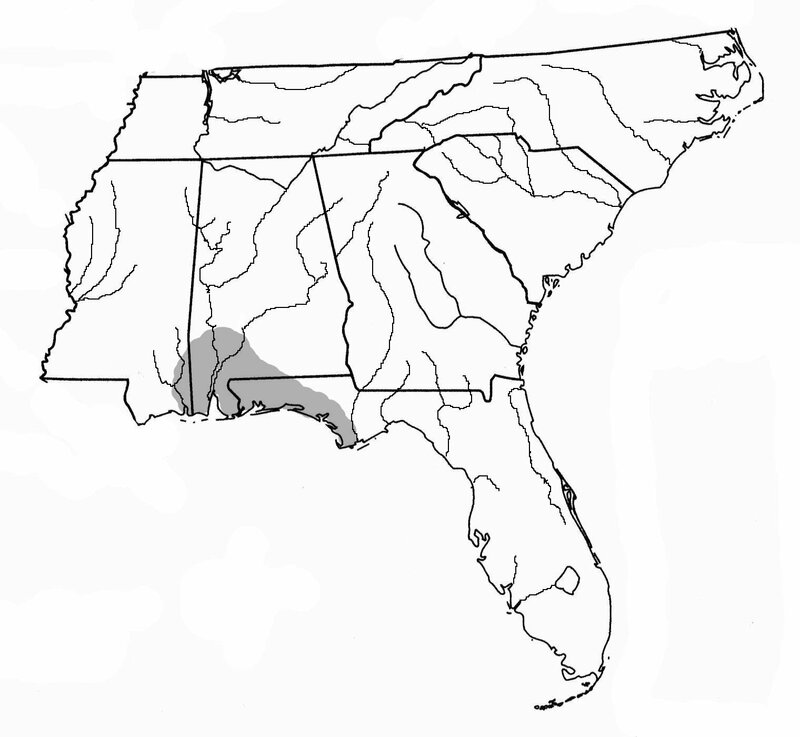 GEOGRAPHICAL DISTRIBUTION: The type is most common in northwest Florida, but it is also found in village sites and burial mounds as far south and east as Tarpon Springs and Tampa Bay. Distribution also extends into southwestern Alabama. SURFACE DECORATION: Some surfaces were floated, bringing finer particles to the surface, but tempering particles are still exposed, making the surface granular. Horizontal, or less often, vertical bands of stamping were stamped on the surface by rocking, or by dragging and punching the tooth-like edge of a scallop shell over the vessel surface. Usually the shell stamping implement was impressed at close intervals that left rectangular or crescent-shaped indentations. Bands of stamping measure from 2 to 4 cm wide and are separated by plain, undecorated strips 1 to 1.5 cm wide, but are occasionally overlapping. Sometimes there is only one stamped band around the vessel rim. Podal supports, when present, were decorated using the outside, ridged body of the shell, giving a grooved, simple-stamped impression. Decoration usually covers the entire vessel except a small space beneath the rim. VESSEL FORMS: Recovered sherds suggest a medium-small to medium deep truncate-conoidal open bowl and a hemispherical bowl. Vessels have ring-shaped or flat circular bases. Later jars had a rounded shoulder and a vertical recurved rim. CHRONOLOGY: This type belongs to the Early Woodland period. Its occurrence at the McQuorquodale Mound suggests a time position between Early and Middle Woodland. TEMPER: This type is tempered with clay, carbonized vegetable material and some sand. Surface colors range from buff to brown or gray. The core is usually gray. Both interior and exterior surfaces are smoothed but not polished and may be lumpy or have visible smoothing lines. SURFACE DECORATION: Decoration was zigzag stamping done by rocker stamping with a single tool moving sideways vertically down the sides of the vessel. The design was formed with vertical parallel rows along the upper portion of the vessel or neck (if present) or between one-third and one-half way down the wall of beaker forms. Stamped rows were often so closely aligned that a continuous field of stamping was formed. The area of decoration was bordered at the top and bottom with a single incised line, or sometimes with a single line of triangular punctations below the band. The vessel wall of the decorated portion is usually thicker than the remaining undecorated wall. VESSEL FORM: Known forms include beakers, caldrons and bowls. Rims are usually rounded, but some have folds that are typically external and vary in width, some decorated with an incised line that runs horizontally with the rim. Lips are often ovate when a folded rim is present, or may be round-pointed when the rim is direct. Appendages sometimes occur in the form of four horizontal flanges. CHRONOLOGY: The highest occurrence of this type appears during the Coles Creek period dating between A.D. 900 and 1200. Associated point types might include the Alba and Colbert types. GEOGRAPHIC DISTRIBUTION: Sherds of this type were found in a number of sites along the northwestern corner of Mississippi in the region of sites surveyed by Phillips, Ford and Griffin. RESEARCH: Phillips Ford and Gordon Willey defined this type as a Marksville related type. The type was described from the Crooks site in Alabama. TEMPER: Clay particles were used as temper in this type. SURFACE DECORATION: This type is the same as Alligator Bayou Stamped (but with clay temper rather than sand temper). The designs are made of shallow incised outlines that flow in both rectilinear and curvilinear lines. Alternate areas between the incised lines are filled with stamped scallop shell impressions made with the zigzag edge of the shell and applied across between the outlined designs in short intervals. Stamping was not walked or scraped as with Bayou La Batre Stamped. Decorations are applied over most of the vessel surface. 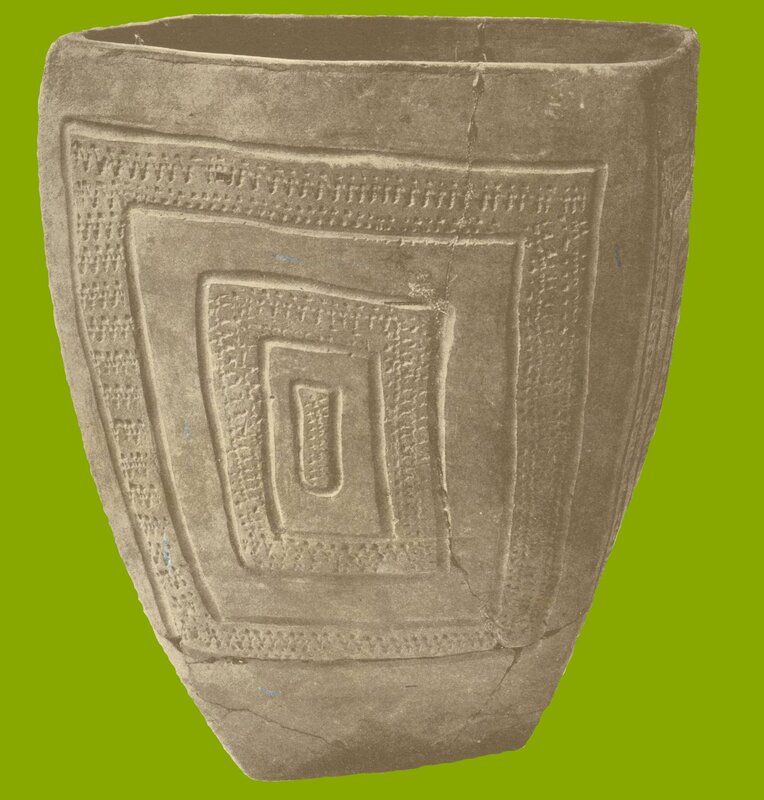 VESSEL FORMS: Vessels were medium sized jars with direct, straight rims. The rims are thickened with flat lips. Bowl forms have slightly constricted rims that have a pseudo-rim decorated with transversely applied scallop-shell stamping. Lips are rounded or flattened. CHRONOLOGY: This is an Early to Middle Woodland type dating between the Techefuncte and Marksville periods. 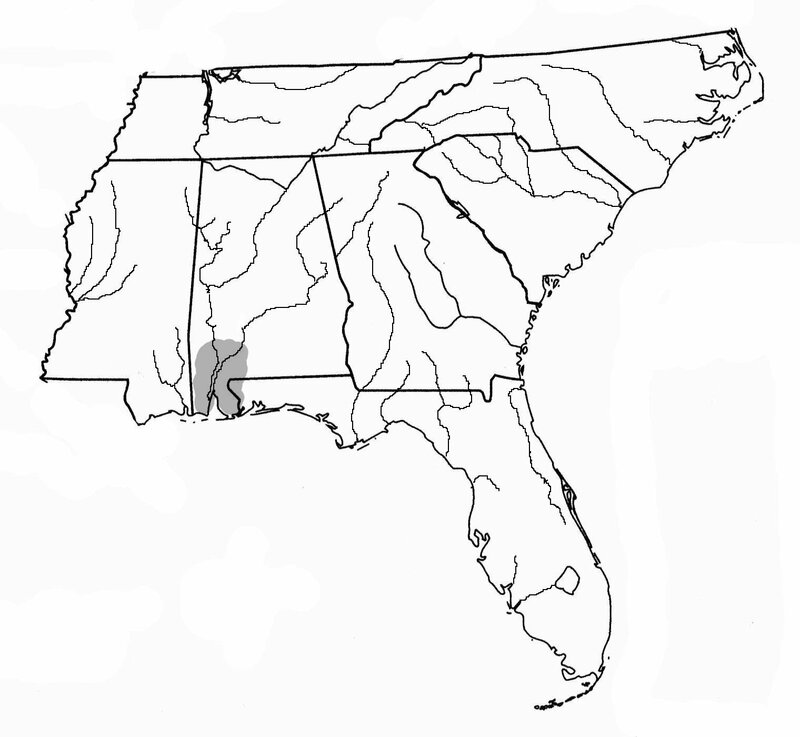 GEOGRAPHIC DISTRIBUTION: The type has been recovered from southern and central Louisiana to the lower Tombigbee River in south-western Alabama. RESEARCH: Phillips, Ford, and Griffin defined this type from their survey of Mississippi in 1951. Their definition of the type was reprinted in the Handbook of Mississippi Pottery Types, SEAC Bulletin No.7 in 1968. TEMPER: This is a coiled type tempered with very small to large clay particles and may include minor amounts of sand and shell that may be accidental inclusions. In many cases the tempering material can account for a high percentage of the paste that causes a coarse, lumpy texture. The surfaces are usually a warm gray or drab, but may also be pink, buff, or red in color. Core colors range from black to gray or buff or are barely discernable from surface colors. SURFACE DECORATION: Decoration on this type is plain rocker-stamping, or occasionally dentate rocker- stamping. The stamping implement seems to have been about 2cm long. The rocker-stamping is done in parallel bands that usually cover the entire surface of the vessel. Some rims display undecorated bands while others have incised lines in an oblique series or are cross-hatched (above). VESSEL FORM: There is little evidence for vessel form. The most likely form is a jar or beaker with vertical or slightly out-flaring rims. CHRONOLOGY: This pottery was produced from the Tchula to Late Baytown periods dating between A.D. 1 and 1000. This type is found with Mississippian Triangular Madison points. GEOGRAPHIC DISTRIBUTION: This type has been recovered throughout northwestern Mississippi. RESEARCH: Steve B. Wimberly reported on this type in 1960. Wimberly’s report on this type was from sites in Clarke County, Alabama. SURFACE DECORATION: The designs were sweeping, curvilinear alternating bands extending from just below the rim line to just above the basal portion of the vessel. Alternate bands were stamped, leaving alternate and contrasting bands unstamped. The primary design lines are moderately deep and U-shaped in cross section. Stamping was done by rocking or walking, sometimes with dragging steps, the tool down the decorated band. An incised line around the rim of the vessel set off the rim from the decorated portion of the vessel. Bands, both decorated and plain, measure between 8mm and 2cm in width. Two or more parallel rows of stamping can appear in a zoned area. Concentric circles or triangles or a single stamped band just below the lip are known. Some plain circles or ovals, some with a central dot, outlined with an incised line exist. Sometimes the rim is separated from the decorated area by several incised lines around the vessel. 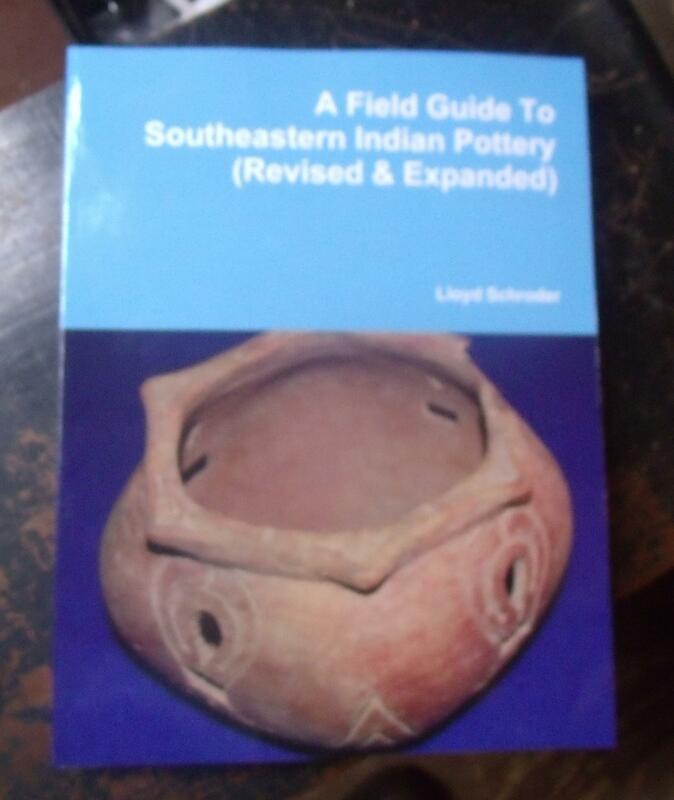 VESSEL FORMS: Sherds suggest medium sized jars with in-slanting rims to globular bowls, flattened globular bowls. Rims are direct except jar rims, which are vertical to in-slanting. Hemispherical bowls have a pseudo-rim line with an interior thickening. Bases may be flat and circular. CHRONOLOGY: This type belongs to the Middle Woodland period. Associated point types are Wilson, Edwards and Maybon points. RESEARCH: William G. Haag named this type in 1939. Caryn Y. Hollingsworth addressed this type in his research at the Sheeps Bluff Shelter site in Franklin County, Alabama. TEMPER: Crushed limestone was used as temper in this type. SURFACE DECORATION: At the Sheeps Bluff Shelter site, Hollingsworth noted that all of the 12 sherds collected were marked with a series of concentric lines around an unidentifiable central element. Limestone complicated sherds collected near Hiwassee Island, Tennessee by Lewis and Kneberg were equated with the Pickwick Complicated type. 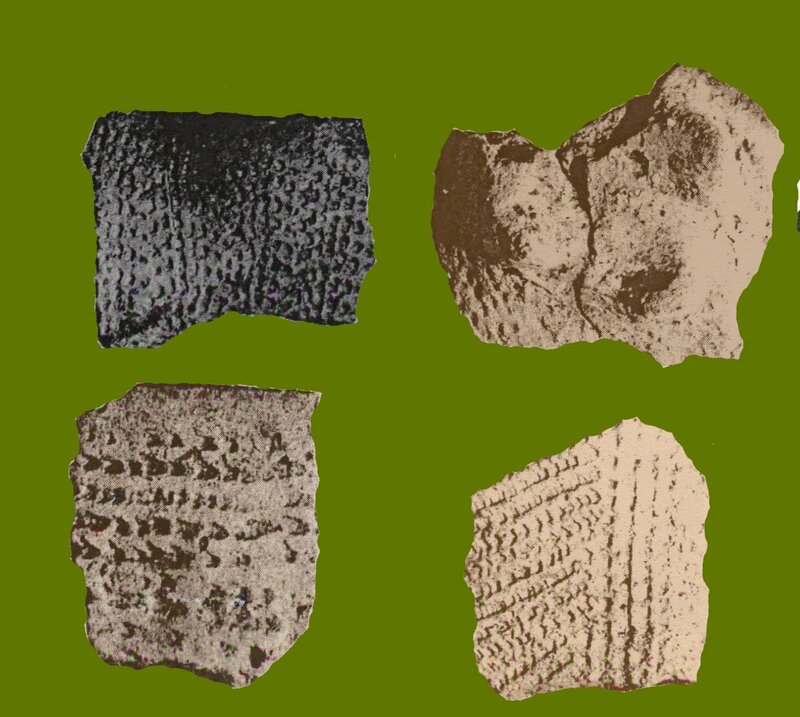 A variety of those sherds (above) are very similar to other sand-tempered Swift Creek Complicated Stamped types recovered near the same area. VESSEL FORMS: Hollingsworth noted that the lips in his study were flattened. Rims from the Lewis and Kneberg study show flattened or rounded lips with recurved, simple, folded, incurved, or out-slanting rims. CHRONOLOGY: This type belongs to the Middle Woodland period. Related point types are spike forms, Woodland Triangular, Baker’s Creek, Camp Creek, Copena, Yadkin, Greenville, and Lost Lake points. 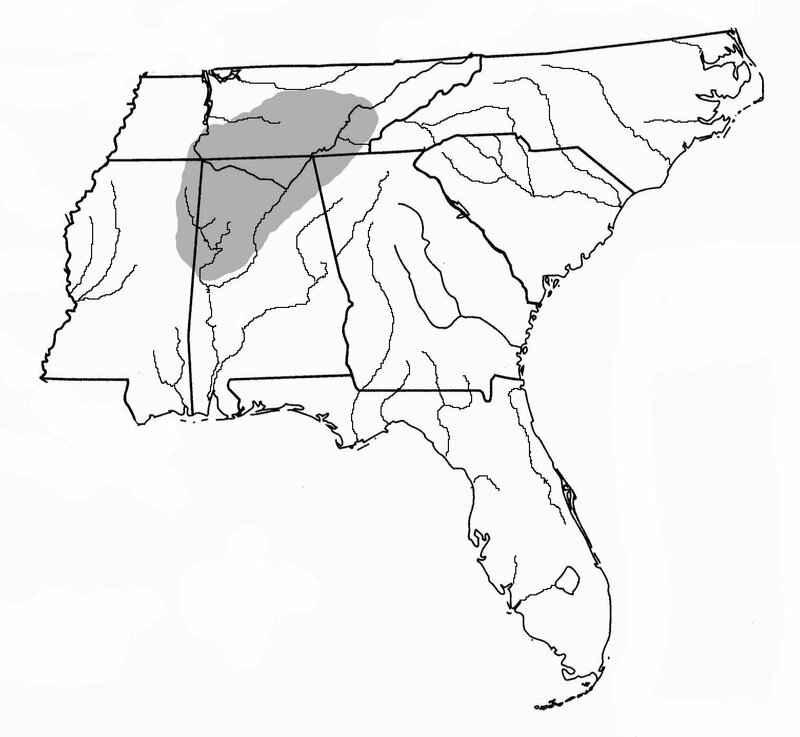 GEOGRAPHIC DISTRIBUTION: This type appears from the Upper Tombigbee River basin to the Pickwick and Tennessee River basins and east to the Hiwassee Island site in eastern Tennessee. TEMPER: This type is clay-tempered with only slight amounts of sand in the paste. The exterior surface is poorly smoothed and lumpy. SURFACE DECORATION: The decoration on this type is rocker stamping in much the same style as Santa Rosa Stamped except that the stamping tends to run more horizontally with the mouth of the vessel. There is no evidence of the use of scallop shell as a stamping tool. The rows of stamping were made with a thin, unnotched implement. There was a single row of stamping about 8mm wide that is 1cm below the lip of the vessel. VESSEL FORMS: The single rim sherd recovered by Wimberly suggested a medium-sized globular bowl similar to the Santa Rosa form. Vessel forms from other Tchefuncte types include deep, conoidal bowls with podal supports and perhaps a hemispherical bowl with straight sides as a minority form. The rim of the Stamped form was thinned by interior beveling with a rounded-flattened lip. 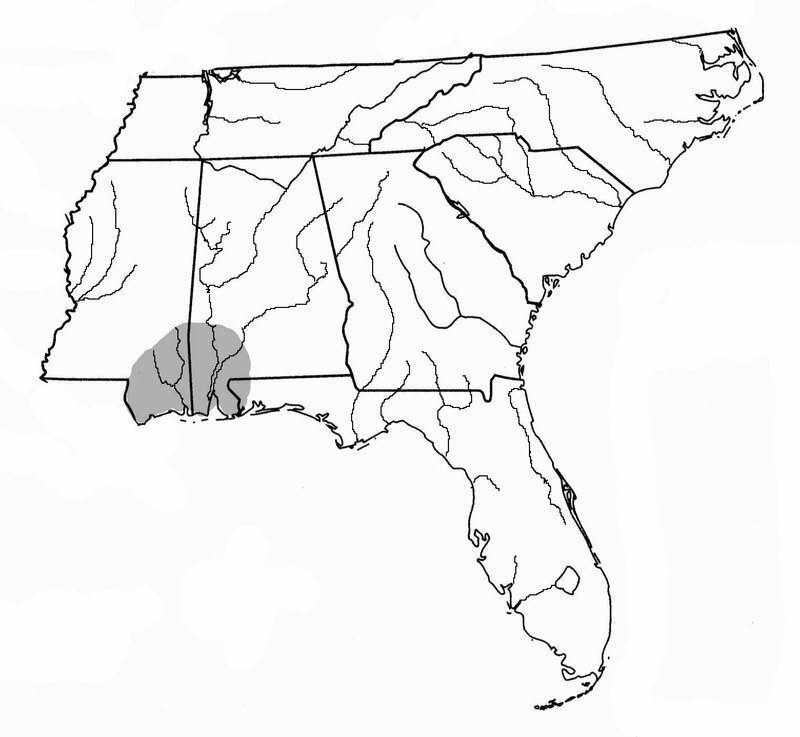 GEOGRAPHIC DISTRIBUTION: Wimberly’s recoveries of this type suggest a distribution within the Mobile Bay and lower Tombigbee River areas of southwestern Alabama. Pottery from the Tchefuncte culture has been recovered from northwestern Florida, Louisiana, western Mississippi, southwestern Alabama, Arkansas, eastern Texas, and as far up the Mississippi River as southeastern Missouri. RESEARCH: Steve B. Wimberly identified this type from fourteen sherds collected from the Porter Village site in Clarke County, Alabama along the lower Tombigbee River in southwestern Alabama in 1960. TEMPER: This type was tempered with moderate amounts of clay particles along with small to moderate amounts of fine sand. The exterior color of the recovered sherds was a uniform gray. The surface had a chalky texture. SURFACE DECORATION: Stamping on this pottery was done with a plain rather than dentate tool. The stamped designs were flowing curvilinear bands of alternated plain and stamped areas in similar fashion to the Marksville pottery. The increased amount of clay in this type seems to be one of its distinguishing features. VESSEL FORMS: One rim sherd indicated a globular bowl with a pseudo-rim that was thickened and had a rounded lip. CHRONOLOGY: The Troyville culture was part of the Late Woodland Baytown period that dated between A.D. 400 and 700. The Troyville culture is believed to have evolved from the Marksville Hopewellian people, thus their pottery designs are very similar. Related point types are Scallorn, Alba, and Hays points. GEOGRAPHIC DISTRIBUTION: The distribution of Troyville pottery is known from coastal Alabama at least as far north as the Porter Village in Clarke County to western Mississippi and into eastern Texas and Arkansas.